New York City 2025. Autonomous stuff is here, and it’s stranger than anyone imagined. 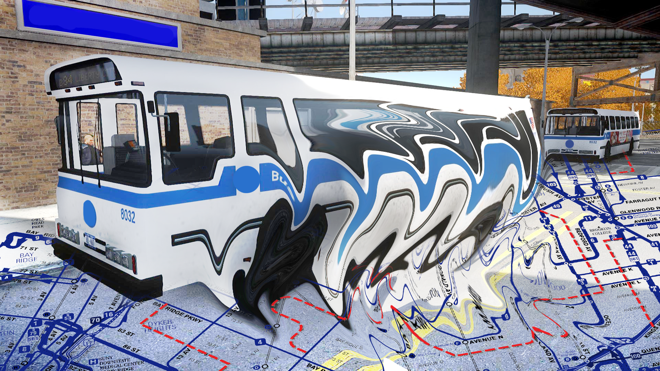 In the wake of Hurricane Hermine, the MTA rebooted with AV buses and real-time routing. On the fringes of Queens, self-driving “dollar vans” aid immigrants in evading deportation. The New York Public Library has deployed autonomous libraries to replace shuttered branches, while a startup billing itself as Uber-for-garbage is using bots for peer-to-peer trash-picking. Looming over all is Amazon, which has mounted cameras across its entire delivery fleet, offering a drone’s-eye-view labeled “presence-as-a-service.” As mayor of a cash-strapped metropolis, you may choose only one of these schemes to support — so, which will it be? This was the question posed to more than a hundred attendees at “Where the Robot Meets the Road: Autonomous Everything,” the second in a series of events exploring the potential impacts of autonomous vehicles. 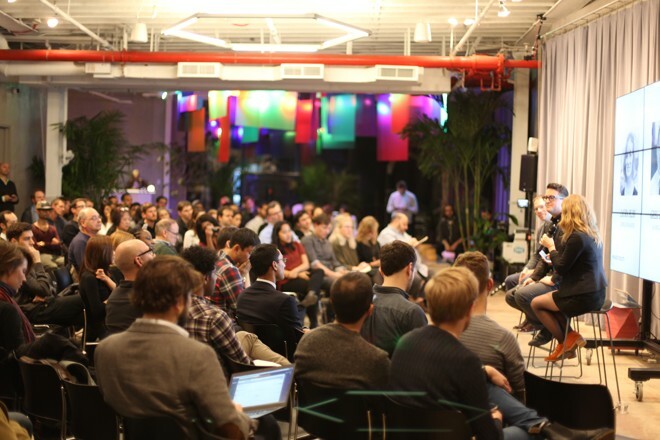 Hosted by URBAN-X — the Brooklyn-based urban tech accelerator built by MINI and Urban Us— guests perhaps expecting startup pitches were instead asked to vote with their wallets (or in this case, tokens) for the best new public good. The five competing proposals had been developed earlier that day by several dozen designers, policy experts, urbanists, technologists, and city and state officials (“the dudes in suits” as one put it), in an effort to think concretely about what an autonomous world should look like, rather than what automakers and technology giants would like it to be. Led by designer Bryan Boyer, who originally created the workshop along with futurist Anthony Townsend for the Bloomberg Aspen Initiative on Cities and Autonomous Vehicles, participants were tasked with turning autonomous vehicle (AV) hype inside-out. Forget glossy corporate brochures and consultants’ 2x2 matrices, they were told. Rather than letting private services run roughshod over cities (again), how could they use automation to solve existing challenges unique to the city? From healthcare to employment, education, and aging, participants were asked to imagine what equity might look like in an age where AVs proliferate. The ones that have tend to be in Sunbelt states such as Arizona, Florida, and California where sprawl is the prevailing pattern. That pattern undoubtedly played a role in the death of Elaine Herzberg in Tempe, AZ on March 18 after she was struck by an autonomous vehicle while crossing a street. Arizona has the highest rate of pedestrian deaths in the nation, which experts attribute to its exceptionally wide streets — the same “wide open roads” Gov. Doug Ducey touted when welcoming autonomous vehicles to the state. One reason Herzberg died, argues Alissa Walker, is because “the state prioritizes cars over the lives of pedestrians.” Herzberg’s tragic death underscored the goal of the workshop. Only by taking the wheel early can policymakers steer AVs in human-centric and locally-appropriate directions. Simultaneously, “autonomous vehicles” is a misnomer, Boyer argued. Autonomy will take the form of robots first, and they’re already here — as deliverybots, pet pack mules, or self-driving suitcases. “Your first robot probably won’t be a car,” he said. And while one robot may be cute, what happens when they become a swarm? San Francisco has already banned robots from most sidewalks for this very reason. Thinking about autonomy as a technology or standalone service won’t help predict unintended consequences. With that warning ringing in their ears, teams self-assembled and set to work drafting solutions tailored to specific provocations. Prompted to sketch the contours of autonomous ‘movers’, one team combined self-service AVs with a white-glove version of the cloud-for-your-stuff startup MakeSpace. Other early ideas included autonomous health clinics, farmer’s markets, stereos, and even prisons — but only during periods of low ride-sharing demand, of course. It gradually became apparent to participants that the central assumption of autonomy — moving people more swiftly and cheaply from A to B — was incorrect, or at least incomplete. Assuming cities remain hard-pressed to deliver public services and that marginalized communities will be the first to lose them, the future of autonomous health isn’t a self-driving ambulance but the clinic in lieu of a hospital. “Is there a new urban edge/core dynamic to be had?” asked Richard Tyson, then the principal strategy director for intelligent systems at Frog. And if so, will AVs be the method for doing more with much, much less? Workshop participant working through a solution. Photo courtesy of URBAN-X. 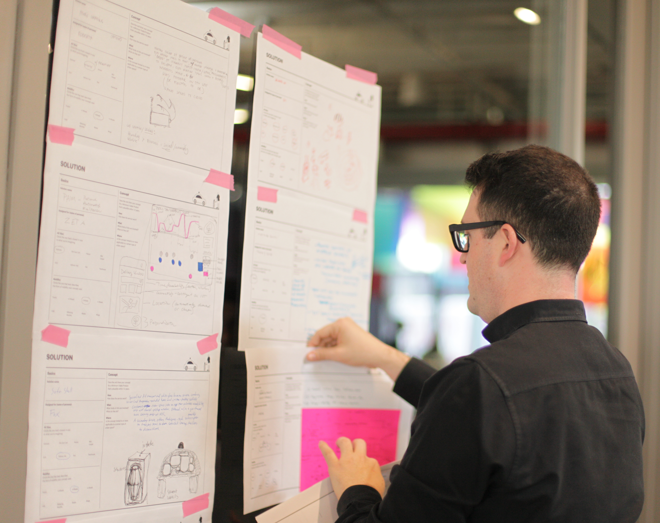 As the workshop entered its final hour, Boyer asked five teams to choose a single idea and develop their sketches into systems. How would their scenarios collide with other aspects of the city as they scaled? The dollar van team, led by the Regional Plan Association’s Mandu Sen and Arup’s Francesca Birks, began by asking how autonomy might make a difference in the working-class immigrant suburbs of Long Island. A point-to-point AV shuttle offers more than just the ability to make do without a car, they argued. Using secure open source software, activist and legal aid groups could provide safety and anonymity to undocumented migrants during their commutes. Meanwhile, the autonomous bus team grappled with the implications of a transit system that never traces the same route twice. A hyper-optimized fleet that never loses money isn’t necessarily a just one, argued Code for Maine’s Nick Kaufman. How would communities accustomed to lobbying for better service refute an algorithm insisting it could never be profitable? Only by publishing the underlying data would cities and their citizens be able to understand these conflicts, and hopefully resolve them. That evening, as audience members listened to representatives of each team make the case for why they — as stand-ins for the Mayor of New York — should select their proposal, urban anthropologist Katrina Johnston-Zimmerman was chosen to give the bus pitch last. Not only would they travel smarter routes, she argued, but the buses would also become the autonomous arm for city services, helping the city prepare for and evacuate residents ahead of disasters. “This is more than solo bubbles moving around our streets,” she said. “This is about people moving together and taking charge of their streets and their city.” Her team won in a landslide. This conversation isn’t happening in Silicon Valley or Detroit, or wherever else the only people around the table are VCs, engineers, and robotics Ph.Ds. Taming the autonomous vehicle demands a human-centric approach to their design — and not only the vehicle, but how the service works and for whom. This, in turn, requires bringing many more stakeholders to bear on the challenge — from policy experts to ordinary citizens — to ensure what works is given a nudge rather than disrupted and broken worse than before. That’s one reason why MINI and URBAN-X hosted this workshop and conversation in Brooklyn as part of ‘Robot Meets the Road’: an ongoing series exploring the future of autonomous cities — and how to use those robots to make them more efficient, livable, and equitable.